Answer: You’re absolutely right. About time I got to that. It’s not the easiest question to answer, but I’ll try to avoid the really complicated stuff. We will need to get into the basic physics of light. There are indeed no green stars, though there are other green objects we can see in space. What makes stars special is that they glow by incandescence. The graph shows what are called blackbody curves for incandescent objects at 3 different temperatures. One of the most familiar ways to produce light is by heating something until it glows visibly. Think of the burner on an electric range, a steel poker in a hot fire, or the filament of a common (incandescent) light bulb. Heated objects emit light over a wide range of wavelengths from ultraviolet, through visible, and into infrared. As the temperature increases, the light distribution shifts toward the blue end of the spectrum, and the peak becomes higher and narrower, but you still get a full mix of wavelengths. Contrast this to a laser, which produces light by a whole different mechanism (stimulated emission). 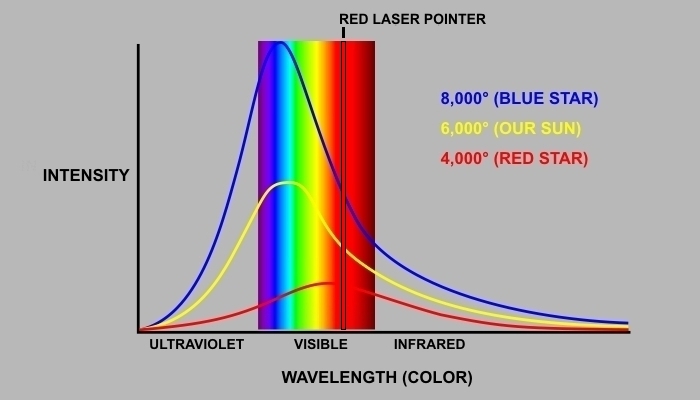 On the graph, laser light shows as a single narrow vertical line at whatever wavelength (color) it’s designed to produce … say, RED for a common laser pointer. But stars are incandescent objects. They’re heated from within by nuclear fusion. Some are hotter, some are cooler. And those temperature differences make them appear different colors. Below are three prominent stars that exemplify the range of possible colors. They’re all Hubble Space Telescope photos, highly magnified, and in true color. Thanks to NASA for these beautiful public domain images. Ignore the size difference. Look at the colors. Can you guess which is the hottest and which is coolest? From left to right the stars are: Sirius (hottest), Arcturus (about the same temperature as our Sun), and Betelgeuse (coolest, but still close to 4000 degrees). These 3 stars correspond closely to the 3 curves on the graph. If you’re wondering, the 4 “spikes” you see coming out of Sirius are optical artifacts caused by its extreme brightness. There’s nothing really shooting out of it. It just looks that way. Now if you made the Sun just a little cooler, so that it peaked in the “green,” our eyes would still see mostly “white.” That’s just the way the eye works. We can see green apples (which reflect green light) or green lasers (which create pure green light) or traffic signals (which filter green light out of a mix of colors), but none of those sources are really incandescent like stars. Their “mix” contains a much narrower range of colors, so our eyes do perceive the light as GREEN. How Dark Is Your Sky? Next Next post: How Dark Is Your Sky?